A few day ago, I told you what my favorite pizza was, today it’s all about burgers – Blue Cheese and Bacon Burgers! I love a good burger – especially one that doesn’t skimp on the toppings! 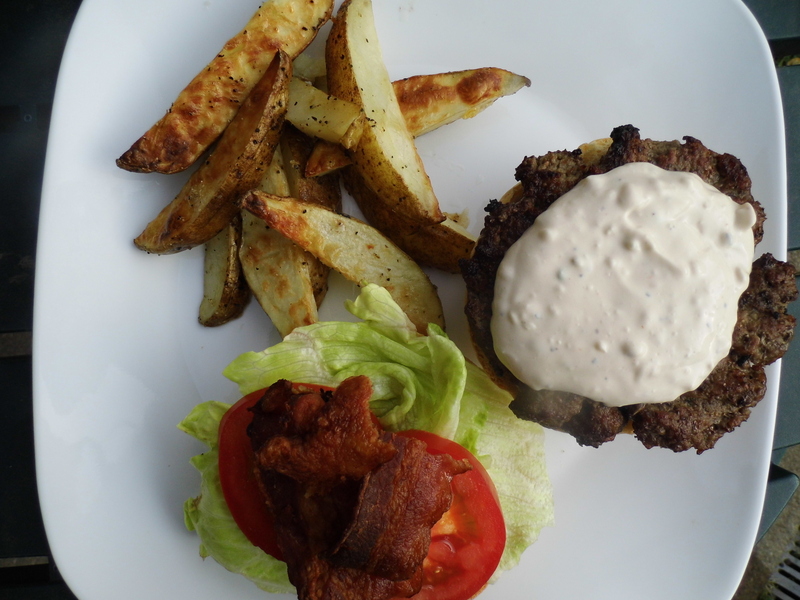 This recipe was created in an attempt to re-create an amazing burger I had while vacationing in Florida. It’s now our “house” burger (except for the kids, they still prefer regular cheeseburgers) – and my favorite! The secret is in the sauce – it’s got bite! Creamy mayonnaise mixed with sour cream, the kick of blue cheese and of course a dash of hot sauce! The smokey bacon combined with fresh lettuce and garden tomatoes provides the perfect contrast. I hope you give this one a try – it’ll soon become your favorite too! Grill hamburgers until cooked through, as desired. We prefer ours medium-well. Lightly toast each hamburger bun and assemble. Serve immediately with lots of napkins! Enjoy! Combine all ingredients in a bowl and mix well. Cover and refrigerate for 1/2 hour to let the flavors come together. Taste and adjust seasonings if needed. This also makes a fantastic salad dressing! I have never tasted a bottled blue cheese dressing that I liked more than this – it’s very distinctive! The total cost for this dressing is only $1.85, I usually double it and use half for burgers and half as salad dressing for the week. Not a bad deal! Do you make your own salad dressings? If not, why? What are your favorite toppings for hamburgers? I’d love to hear from you! This looks so good! I love anything involving blue cheese. I’d have to say there is a tie for my favorite burger toppings between blue cheese with caramelized onions and cheddar with horseradish sauce. You just gave me an amazing idea – adding some caramelized onions to this would be GREAT! I also am very interested in the cheddar/horseradish combo….hmmmmm….. Going to make this soon! Looks so good. I love a good burger! everything is better with blue cheese and bacon. love this post! I luv blue cheese 🙂 looks mighty taste Stephanie….it’s so rainy here, maybe for the weekend when they say it’s supposed to clear up. It’s rainy and humid here too, I’m hoping it clears up soon, very dreary day! I hope you like the burgers! I was already impressed until I saw you made your own buns as well!!! This looks awesome and as we’re burger lovers too….I’m definitely going to give this a go! I’m just eating my breakfast while I check out this mornings posts…and instead of toast I’d rather be eating your burger….or your bunwiches!!! Glad to know I’m not the only one who thinks that way! Blue cheese and bacon on a burger? Best combo ever! Looks delicious. Hands down my favorite burger! Cant wait to try the creamy blue cheese recipe! Please do – you won’t regret it! I happen to love Ranch dressing on my hamburgers. But I also like bread and butter pickles, dill pickles, tomato, lettuce, bacon, and of course, cheese. I like my burgers loaded. Loaded burgers are the best! Ranch would be great on a burger too! 🙂 I would love to hear what you think! While I’m not 100% sure, I’m fairly certain this is the BEST burger combination ever. Most bottle blue cheese dressings are pretty bland. Mostly mayo/cream and not much bleu cheese flavor. I’m totally a fan of the homemade! I agree! I love that I can add as much garlic and blue cheese as I want! Absolutely. I am a firm believer that I’d you can make it at home, you probably should.